Vent installation has long been one of the most frustrating aspects of building installation. Vents must be purchased to match a specific wall width, and they must be already on-site when walls are finished in order to facilitate timely installation. That means even a small fraction of a difference between the wall-width and the actual final width of the wall can leave workers with vents that don’t fit and are unusable. New vents must then be purchased, causing delays and wasting money. The same situation can play out when workers receive the incorrect size of vents. Mar-flex’s Vortex Vents make these situations a thing of the past. Vortex Vents are telescoping vents, able to expand from 7.5″ to 10″ wide. For the first time ever, a single vent can now fit 8″, 9″ and 10″ walls. Vortex vents also provide advantages for dealers and distributors, providing a versatile product with a single SKU. Vortex Vents are made of high-density polyethylene construction, so they don’t chip or corrode. 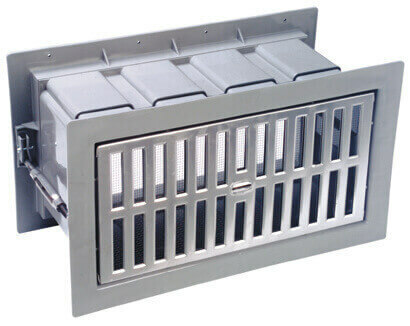 Vortex Vent models are easy to install and are approved for use in poured and block wall applications. Vent features easy-to-access controls that allow user to adjust airflow. Adjusts from 7.5 to 10 inches and fits 8-, 9- and 10-inch walls, nominal or full size. Clear Vent Area (CVA) 31.4 – Screen included.